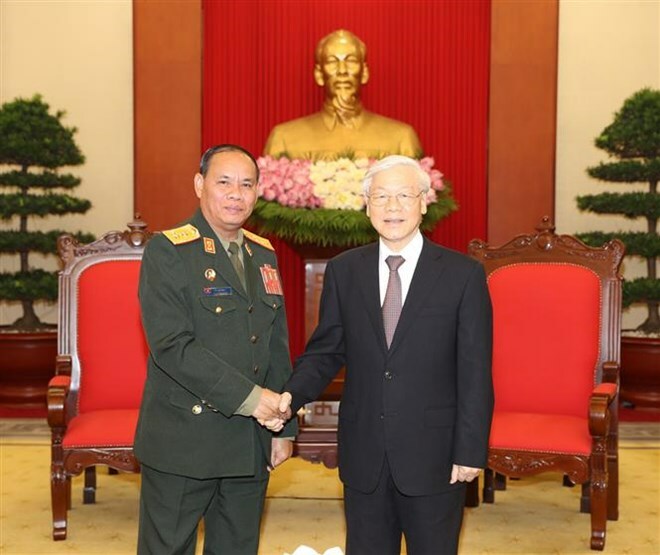 Hanoi (VNA) – Vietnam’s Party and Government always create best possible conditions for the Vietnamese and Lao defence ministries to promote cooperation for political stability and social order and safety in both nation, said Party General Secretary Nguyen Phu Trong. The Party chief made the statement when receiving Director of the General Department of Politics of the Lao People’s Army Vilay Lakhamphong in Hanoi on August 2. Trong hailed growing engagements between the two armies over times and outcomes of talks between their senior officials. Highlighting achievements secured in bilateral defence cooperation, a pillar in the Vietnam – Laos relations, he urged the two armies to expand their joint work to fulfil their political missions. For his part, Vilay Lakhamphong informed his host on Laos’ recent affairs, cooperation outcomes between the two defence ministries and results of his talks with officials of the General Department of Politics of the Vietnam People’s Army. He stated in any circumstances, the Lao Defence Ministry will always work closely with its Vietnamese equivalent body to carry out their cooperation plans and agreements sealed by high-ranking officials from both nations.